Malaysia Airlines in state 'takeover' Jump to media player Malaysia's state investment firm Khazanah Nasional has proposed a "complete overhaul" of troubled national carrier Malaysia Airlines. Australia commemorates MH17 dead Jump to media player Australian Prime Minister Tony Abbott has lead a multi-faith service on a national day of mourning for victims of MH17. Uncertain time for Malaysia Airlines Jump to media player The future of Malaysia Airlines depends on what its biggest shareholder, the government, wants to do says an industry analyst. Malaysia Airlines' future questioned Jump to media player Analysts are questioning whether Malaysia Airlines can recover from two tragic disasters this year. Could 'hotspot' solve MH370 mystery? Jump to media player It is more than 100 days since Malaysia Airlines flight MH370 disappeared en route from Kuala Lumpur to Beijing, but international search teams have yet to find any trace of the missing plane. 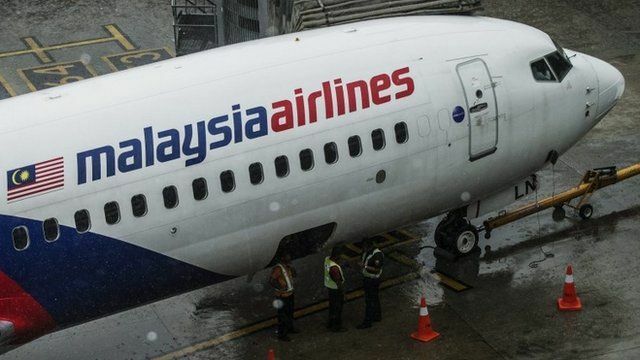 Burst tyre forces plane to land Jump to media player A Malaysia Airlines plane has had to make an emergency landing in Kuala Lumpur after a tyre burst during take-off. 'Significant lead' in MH370 search Jump to media player An Australian vessel searching for missing Malaysia Airlines flight MH370 in the southern Indian Ocean has detected signals consistent with those from "black box" flight recorders. Malaysia's state investment firm Khazanah Nasional has proposed a "complete overhaul" of troubled national carrier Malaysia Airlines. The airline has been hurt by two major tragedies - the crash of flight MH17 in Ukraine and disappearance of flight MH370 - in recent months. The two incidents have triggered concerns about the airline's future.